We had a really great stay here! The beds were so comfortable and we always had a hot shower. They have a nice rooftop cafe with a full menu. The location is perfect, down a side street so not too noisy. Really lovely staff that make you feel welcome into the city and hostel. 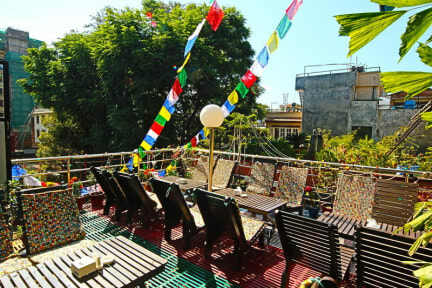 Beatiful hostel in a wonderful location that is amongst Thamel and the nightlife but you cannot hear any nightlife from the rooms. Rooms and bathrooms are tidy and clean. Breakfast is included and very nice. Have booked to stay again at this hostel after we have finished volunteering. Great location. Quite relaxed hostel/hotel. Nice rooftop area to relax outdoors. Private rooms are good value for money and are secure. Some dorm rooms didn't have working locks on lockers. Was told I could leave my stuff here for free in storage while away trekking but then what seemed like a manager gave me a hard time about it which was a disppointing start/poor welcome. Not very boutique, but nice enough hotel in a good location just on the outskirts of Thamel. Rooftop was nice and gave more of a hostel vibe. Room smelt musty and had 5 beds squeezed in it when we’d only booked a double! Breakfast had good variety and different every day - but quite expensive. Disappointed that our airport transfer didn’t turn up for our late night arrival (and we got no apology) but found the airport taxi was cheaper and just as easy. This was the most expensive hostel I booked for my trip. Ensuite bathroom was clean but I feel the bedroom area itself was not as clea. I'm sure the outside beding was not replaced from the previous occupant. I didnt personally see any security, only receptionists sleeping on the sofa. Rooftop area nice and option to order food to room. Staff very helpful and polite. Very noisy in the night, loads of banging/ traffic if you're in the back of the second building. Probably wouldn't stay again. Really hard place to rate, really liked the hostel itself (can’t fault it). Also really liked the area during the day and the evening. However during the night I like to sleep in my bed not listen to load music, people shouting etc. So in conclusion nice hostel, interesting area be prepared for a noisy night. I paid a deposit to stay at the Shangrila Boutique Hotel, however when I arrived the hostel was fully booked. I would like a refund on my deposit as I was unable to stay at the hostel. Thank you in advance for your help!